The introduction describes how any body system can be affected, and how the most important clues to the cause or causes of any problem usually found in the patient’s story. The skill of the investigator lies in recognising important statements, and following them up to form a pattern. Specialisation has resulted in barriers between clinics for chest, ear nose and throat, skin, and so on, so that some unfortunate patients attend several clinics when there should be one allergy clinic for all allergic problems. Both public and doctors have become obsessed with” tests”, often believing that sending away blood, hair, or faeces will result in a diagnosis by return. For allergies this is often a fallacy, because a positive result means little unless the doctor can make sense of the result, and a negative test result does not exclude intolerance because there are no tests for intolerance to foods, except avoidance to see what happens. It is much quicker to get blood taken than to take a history, especially as it is unusual for a doctor to know the right questions to ask or to recognise significant answers, because doctors are so seldom taught anything about allergy in Medical School. Food Intolerance differs because there are no reliable tests, leading to difficulties in diagnosis. Manipulating the diet is necessary for diagnosis and treatment, and several foods may be involved. A Global Diagram is presented to show how different organs of the body can be affected, and that an allergy specialist must consider the human body as a whole, not just each of the parts in isolation. This website is dedicated to the millions of British allergy sufferers who have great difficulty in obtaining expert advice regarding their problems. One reason is that the subject has been so rarely taught in British medical schools that most doctors know very little about allergies. Paradoxically, Scientific Allergy Research in this country is renowned world-wide, but is mainly targeted at finding out what happens in an allergic reaction, and discovering how to stop or control it. Generous support is given by the pharmaceutical industry, hoping to find a way to completely suppress all allergic reactions without side-effects or any need to find the cause of the problem. 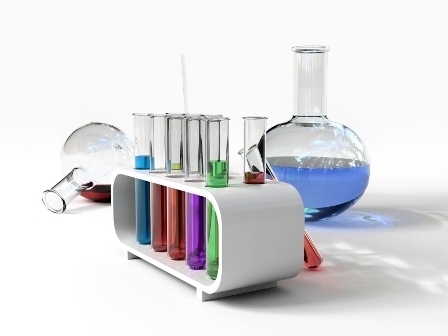 “Breakthroughs” in research often hit the headlines, but it is not sufficiently realised that even if such a discovery were to be announced tomorrow there would still be many, many years of clinical trials before the remedy could come into general use. Hopes that a potential panacea to cure all has been discovered are often dashed, but the disappointing news seldom gets the publicity which was given to its discovery. Meanwhile, Clinical Allergy, which involves the investigation and management of a wide range of allergic diseases and reactions, has been so seriously neglected that there is now only one allergy specialist for every three million people in the UK, and large parts of the country have none at all. There are only eight centres of excellence for allergy in Britain, so we could be said to have the most inadequate allergy service in Europe. Allergic reactions can affect any part of the body, therefore a clinical allergist should have very wide interests extending to all body systems. This generalised feature of allergic diseases is often not appreciated by other specialists, especially in recent years since the boundaries between specialties have become more and more strictly defined and developed. For example, very few British paediatricians are knowledgeable about allergy, yet their wards are crowded with asthmatic children who seldom have their allergies properly investigated, and most British skin specialists do not appear to accept the importance of allergy as a cause of eczema. Two hundred years ago allergies were very uncommon, but have become more and more prevalent in developed countries, especially in the last fifty years. In 1997 a European White Paper was published, which declared Allergic Diseases to be a Public Health Problem in Europe which is so large that it should be called the First Epidemic of the 21st Century, but Britain took little or no notice. It is undoubtedly true that Allergies of all kinds have increased to the extent that over a quarter of the population in all developed nations is now predisposed to develop allergic problems. This increase in allergies has coincided with global changes, such as the industrial revolution, increased pollution of air and water, and huge changes in the diet and environment with the adoption of western life-styles. For example, since pasteurisation and refrigeration made possible the production of huge amounts of milk, almost everybody has some milk products every day of their lives. More recently central heating, double glazing, and fitted carpets have provided the ideal habitat for the dust mites, the major environmental cause of asthma and rhinitis. Our environment has also been contaminated with myriads of new chemicals, food colourings, preservatives, pesticides, and drugs to which man has never been exposed before. Furthermore, over recent years there has been a serious and progressive decline in the quantities of trace minerals in the soil which are essential for the health of all plants. In their turn, these trace minerals are essential for the health of both man and beast, who eat the meat and vegetables. This decline in essential minerals has been so drastic that it may be a factor in the increase in allergic diseases. It seems reasonable to suggest that these enormous environmental and dietary changes must have strained the human capacity for adaptation to the limit. In consequence more and more of us fail to adapt to these changes in food and environment which, in an evolutionary sense, have occurred comparatively rapidly. As a result, a minority have reacted against these changes in an abnormal, excessive, and self-destructive manner by developing allergies, which might better referred to as Diseases of Defective Adaptation to the Environment. These considerations also apply to coronary disease, hypertension, and diabetes, because all these diseases have increased rapidly within a few decades, whenever Western life-styles and diets have been adopted by developing third world countries. It is undoubtedly true that many people dig their graves with their teeth! Heredity is also very important because if neither parent has an allergy the chance of a child being allergic is only 5-15%, and if one parent is allergic about 25%. But if both parents are allergic 50-70% of the children are likely to have allergies. People from allergic families often have positive skin reactions and sometimes positive blood tests to environmental allergens as well, yet they have no allergic symptoms. To be sensitised without symptoms is called “atopy”, and these people are called “atopic” because they have a strong tendency to develop allergic diseases if they are over-exposed to allergens, as when renovating an old house and being exposed to lots of dust. They resemble a loaded gun, which will not go off unless the trigger is pulled. This website is exceptional, because the infinitely variable presentations of allergic disease are illustrated by case-histories and photographs from my files, which are undoubtedly more memorable and interesting than purely scientific reports. These date back many years during which I have sometimes had the privilege of observing children with allergic problems grow up, get married, and raise families who also have allergies. Some readers might even identify with an unusual story which might suggest a possible answer to their problems in a way that cold statistics could never achieve. I have also tried to express my personal opinions regarding clinical allergy as clearly as possible, and I leave it to the reader, whether medically qualified or not, to decide if these concepts and experiences are significant or otherwise. It is fashionable in medical circles today to disparage and dismiss interesting observations and individual case-reports as being ‘anecdotal’, and therefore of little or no significance. This is to ignore the fact that the recognition of many diseases began by studying individual patients, relying entirely on case-history, clinical findings, and accurate observation, confirmed many years later by the development of scientific tests. Acceptance of a new pattern of illness, or “syndrome”, can be seriously hindered by the lack of a diagnostic laboratory test. The interactive and time-consuming taking of a case-history is becoming a neglected art today, yet our patients all have meaningful stories to tell if anyone will listen and try to interpret them. To rely purely on laboratory diagnosis is to regard patients as being like animals and unable to communicate. Allergic patients are a very individualised group of people, who complain of a wide variety of symptoms caused by an infinite range of possibilities, so that they are very difficult to sort into tidy groups. It is often said that 'there’s now’t so queer as folk', but allergic folk can be the queerest of all!!!!! These individual case-histories refer to one individual’s problems and their solution, and will not mean much unless the reader has some knowledge of the broad principles underlying the causation of allergic disease. For this reason it is suggested that the introductory section with the Global Diagram be read carefully before looking at the individual sections. The World Wide Web gives me the opportunity to share my experiences with colleagues interested in Clinical Allergy, which is truly the Cinderella of all the Medical Specialities. Large sections refer to hitherto unpublished researches which might interest colleagues as well as those plagued with allergies. Many individual case-histories are detailed which led to successful advice or treatment when allergy or intolerance had not been suspected, but these stories can only be regarded as pointers suggesting a possible cause. Statistically significant data, evidence based medicine, and ‘meta-analyses’ of published research papers are rightly the current gold standards of conventional medicine, but allergic diseases are so infinitely variable and individualised that they often do not fit into any rigid classification. 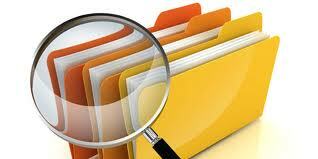 For example ’Meta-analysis’ is a statistical ‘audit’ of all published papers or clinical trials on a specific subject. First of all the papers to be reviewed are selected using rigid criteria which always exclude all trials which were not double blind and placebo controlled,. This selection process can seriously affect the result and reach a totally wrong conclusion. A good example is a meta-analysis which found no evidence of benefit from any method of controlling dust mites, which was published in the British Medical Journal in spite of the fact that this conclusion is obvious nonsense. Current methods used in clinical trials are ill-suited to allergic disease, where each patient is very much an individual with specific personal problems. For example the effects of treating a patient, or of treating their environment with an agent to kill the mites, can be effectively assessed In clinical practice by comparing their disease state before and after the intervention, using all available objective methods such as peak flow rates in asthma, measuring precisely the amount of dust mite in house dust, and subjective symptom diaries. In short, by using the patient as his or her own control the results will soon indicate whether a treatment is effective or otherwise. Unfortunately nowadays this time-honoured method of assessment of a therapy has become quite unacceptable and, at the present time (2010), clinical trials have become beset by distrust and often strangled with red tape. There are already many websites which give helpful information and advice about allergies, so I have not attempted to be comprehensive. To write a website about allergy has been a daunting task which I felt unable to undertake until I was fortunate enough to initially obtain expert help in Web design from Alex and Alastair Campbell of Surescreen Ltd. Derby, followed by a complete website redesign in 2011 by Graeme Storey, of Force 10 in Scotland. Please note that this website is for information and interest only, and is not intended as medical advice or advice on treatment. I cannot be held responsible for any actions that anyone might take as a result of reading the information in this web-site. I am particularly concerned that nobody should adhere to a restrictive diet for more than about three weeks, and that medical advice should be obtained before dietary manipulation. To illustrate how allergy can cause such a wide range of problems I have constructed a diagram to demonstrate how the whole body, or only parts of it, will react to the ‘allergen’, the name for the cause of an allergy. When the ’allergen’ is inhaled, ingested, or contacted, a reaction will occur only in the part of the body which has become sensitised. For example ingesting a food to which the subject is allergic may cause a reaction in the gut itself causing rejection by diarrhoea or vomiting, or be absorbed into the blood to reach other sensitised parts. The result depends on how sensitive the allergic part of the body may be, how much allergen has entered the blood, and whether the reaction is fast or slow. For example, when the whole body is very sensitive, life-threatening anaphylaxis occurs on exposure to the allergen because everything reacts at the same time. 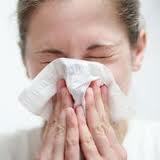 The symptoms depend on which part of the body is sensitised to the allergen. An allergen inhaled with the air we must breathe, such as pollen in summer or dust mites all year round, will produce hay fever if the nose is the sensitised area, asthma if the bronchial tubes are sensitised, or both simultaneously. This reaction happens rapidly on contact with the lining of the respiratory system, but sometimes the respiratory system does not become sensitised, and the allergen gets into the blood to reach the sensitised skin, causing eczema. Direct contact from outside the body may also cause eczema by entering the skin through invisible cracks. 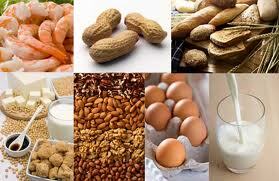 Food allergy is when eating a tiny amount of a specific food causes an obvious reaction anywhere in the body. When a reaction takes place all over the body at the same time, this is acute anaphylaxis, the most dangerous manifestation of allergy. What has happened is that an antibody called IgE has been developed towards a specific food and is circulating in the blood. Its presence can be detected in the blood by the RAST test, an immunological test carried out in a laboratory. This IgE antibody sticks to the surface of special allergy cells called ‘mast’ cells, which are to be found in the lining of the blood vessels, the bronchi, the nose, the eyes, and all over the body in the skin. The mast cells in the skin are responsible for producing specific reactions to skin testing which indicate the causative allergens. When tiny amounts of food are absorbed from the gut into the blood, as shown in the Global Diagram, they finally reach the IgE antibody on the surface of these primed mast cells. This triggers them to disintegrate and set free a variety of nasty chemicals into the body fluids, one of which is histamine. It is these chemicals, usually referred to as ‘mediators’, that cause the allergic reaction to take place. Various drugs, such as antihistamines, block or suppress these reactions to a varying extent. A skin prick test is performed by pushing a testing needle through a drop of testing extract on the skin. The point of the needle carries a very tiny trace of the allergen into the skin where it comes into contact with mast cells which are already primed with specific IgE for all the allergens to which the patient has become sensitised. If the testing extract contains an allergen which reacts with specific IgE on the surface of the mast cell, that cell will disintegrate releasing ‘mediators’ which cause itching and secretion of fluid, producing a wheal and itching within fifteen minutes if the skin test is positive. The specific allergen can be compared to a key, which only turns on the patient’s reaction if it fits the specific IgE antibody on the mast cells which then liberate the mediators. 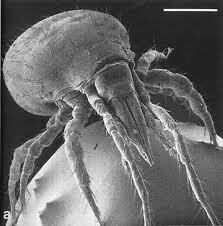 Typical examples are hay fever due to pollen, asthma due to dust mites, and anaphylaxis due to peanuts. Problems investigated by allergists usually include anaphylaxis, acute food allergies, asthma, hay fever, perennial rhinitis, allergic conjunctivitis, urticaria and sometimes eczema. Some allergy specialists have a major interest in the immunological aspects of allergy, and are less likely be interested in food intolerance where diagnostic tests have not yet been developed so that the only way to establish a diagnosis is by manipulating the diet. Sometimes, after reading an article in a magazine, patients with chronic problems may ask their doctors if the cause of their troubles could be in their food. Unfortunately this suggestion is often rejected because the British medical profession are usually unaware that a very wide range of disease can sometimes be caused by allergy or intolerance to foods. We will never know how often food is a causative factor in many illnesses until large trials of elimination diets in a wide variety of chronic conditions are carried out. This is unlikely to happen because of the current tendency to suppress symptoms with medication, and the fact that what most people want is a pill for every ill, and a quick fix. The introduction of an elimination diet for two or three weeks could exclude the possibility of food intolerance being part of the problem. There is nothing to lose but a few pounds! 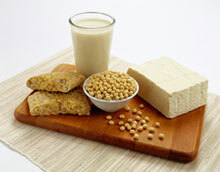 Intolerance to foods presents much less clear cut problems than food allergy. The main reason is that the association between eating a normal amount of the food and its adverse effects is usually delayed by some hours, often the next day, or may even build up over several days. These slow reactions make it difficult to obtain clear-cut cause and effect evidence to prove if a specific food is causing the problem or not. Skin and RAST blood tests are negative in Intolerance because IgE antibodies are not involved in intolerance reactions to foods, and how and why reactions takes place has yet to be discovered. At the present time the only method which can be relied on to identify the food or foods causing a problem is dietary manipulation. This is a procedure which requires dedication and strict compliance by the patient, but when carried out properly the identification of the causative food can revolutionise the lives of some patients. Uncontrolled or desultory dietary manipulation and experimentation can result in diets which are actually harmful, so it is very important to establish beyond doubt that the patient is truly intolerant of a specific food. To be certain it is essential to demonstrate that the consumption of the same normal amount of the suspected food will produce the same effects after about the same time interval on two, but preferably three occasions. This can be difficult. Many tests promise quick answers, such as Kiniesiology, Vega testing, bio-energetics, and many other tests available in health food shops or from unqualified practitioners. Very expensive blood tests are advertised direct to the public which claim to find IgG type antibodies against specific foods in a drop of your blood, but these tests which have never been subjected to acceptable clinical trials. For example a recent patient who had been avoiding wheat and milk for two years because she suspected them as the cause of her migraine and Irritable Bowel Syndrome had sent a drop of blood for testing, and was surprised that antibodies to wheat and milk were not found by the laboratory. When she questioned this result she was informed that the reason IgG antibodies to wheat and milk were absent was that she was avoiding these foods! As specific IgG antibodies are produced in normal people, this suggests that the significance of IgG antibodies is very doubtful indeed. Foods which are eaten daily or several times a week may not be suspected as a possible hidden cause of a chronic problem such as asthma or eczema which is being controlled more or less effectively with drugs, hence without trying an elimination diet for a trial period these hidden factors will never be found. Foods should be considered as a possible hidden cause of so–called ‘brittle’ asthma, a term applied to many middle aged patients with severe asthma. This term is simply a label which means unstable and difficult to control, and these patients are often completely dependent on oral steroids. To make things even more complicated, the sensitised organ of the body sometimes changes over the years. 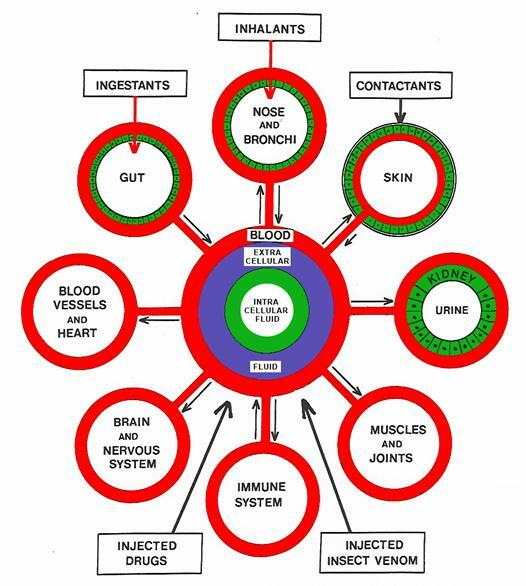 For example a daily food, particularly milk, can cease to cause gut problems, and instead cause chronic eczema or asthma, as shown in the Holistic Diagram in the Introduction. Over a period of twenty years or more I have seen a few patients who began with irritable bowel or mild colitis, get better with a milk free regime, then get careless about diet and develop arthritis, followed years later by asthma due to a different food this time. These remarkable patients often observe the connection themselves, but unfortunately have their ideas rubbished by family doctors and even by consultants in the various special departments they get referred to. Case-histories elsewhere illustrate these unusual cases. Food Intolerance is a very ill-defined condition, and there are no reliable blood or any other tests which will tell you what not to eat to get better. Sometimes several body systems are involved. For example many asthmatics also have nasal allergies which are often overlooked, and sometimes eczema as well. Sometimes the part of the body affected will change over the years, and patients may attend several special clinics instead of only one general allergy clinic. Unfortunately special departments may be unaware of the possibility that allergy could be the cause of a problem they are treating. Over-specialisation can create unnecessary boundaries between specialities and ignore the fact that the various organs and organ systems function as a team, so that the human body functions as a whole, not as separate systems. As illustrated by the global diagram, allergy can affect any part or several parts of the body, so that the doctor or his patient may have difficulty in deciding if the problem is due to an allergic reaction or not. 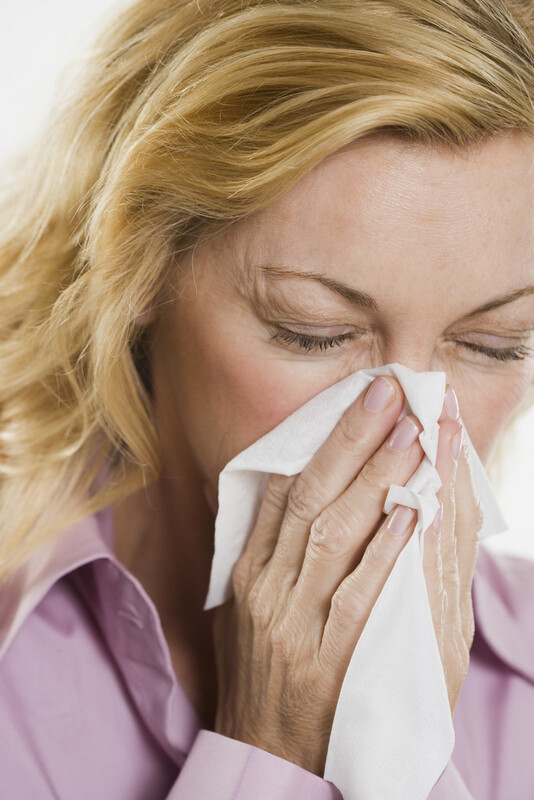 Allergies can mimic many other medical problems, especially when related to digestion. Everyone knows that vomiting and diarrhoea can be caused by an infection, such as salmonella, or because the food contained some toxic or poisonous substance which is being rejected by vomiting or diarrhoea. Sometimes people develop a psychological aversion to a food which will make them sick if they eat it For example, when an orthodox Jewish lady was told that the meat she had just eaten and enjoyed was pork she promptly vomited. Chronic bowel disorders have many causes as well as allergy or intolerance, so it is premature and unwise to jump to conclusions that a complaint is caused by an allergy, or that specific foods are causing it. For example there may be insufficient enzymes essential for digestion of milk, such as lactase, the absence of which causes diarrhoea. Gluten from wheat may damage the lining of the gut causing coeliac disease, additives such as sulphites, flavouring agents, MSG,, preservatives, and dyes sometimes cause problems, but less often than usually thought to be the case..
An attack of diarrhoea on holiday may damage the lining of the gut so that, after recovery from the acute phase, chronic problems persist. Several cases have been seen whose “irritable bowel” cleared up after avoiding milk and milk products. Reintroduction of milk a few months later caused no relapse, suggesting that the infection had damaged the lining of the gut producing a temporary intolerance of milk, and a deficiency of enzymes, which had recovered with temporary avoidance of milk. Abdominal symptoms can have many causes, so it is essential to consult the doctor who will, if it is considered necessary, arrange for an investigation by a gastroenterologist to exclude serious possibilities before jumping to the conclusion that the problem is related to food. Coeliac disease is caused by a different sort of reaction where gluten, mostly derived from wheat, destroys the lining of the intestine and prevents the normal absorption of nutrients, especially fats, resulting in pale stools, diarrhoea, malnutrition, and many other problems. This disease is very important to discover because with total avoidance of gluten the wall of the gut heals and regenerates, and a complete cure is to be expected, but gluten has to be avoided permanently. Coeliac disease is not usually classified as an allergic disease, as the antibodies are not the IgE type, and it usually falls within the specialty of gastro-enterology, but diagnostic blood tests are available to any GP if it is suspected. In recent years tests for Coeliac disease have been improved and made more sensitive, and as a result milder forms of this disease have been found to be much commoner than was previously thought. Farmers lung, bird fanciers lung, and similar problems are caused by the inhalation of organic dusts at work or in the home environment from keeping birds, and are usually dealt with by Respiratory Disease physicians These serious problems are to be found in farmers, bird breeders, pigeon fanciers, and anyone inhaling any kind of organic dust. The cause is a reaction of the immune system to these inhaled dusts, with the development of a precipitating antibody response to these dusts which is not IgE mediated, and will cause irreversible damage to the lungs unless diagnosed early. These problems are not related to asbestosis or silicosis caused by inhaling inorganic asbestos or silica dusts, usually at work. 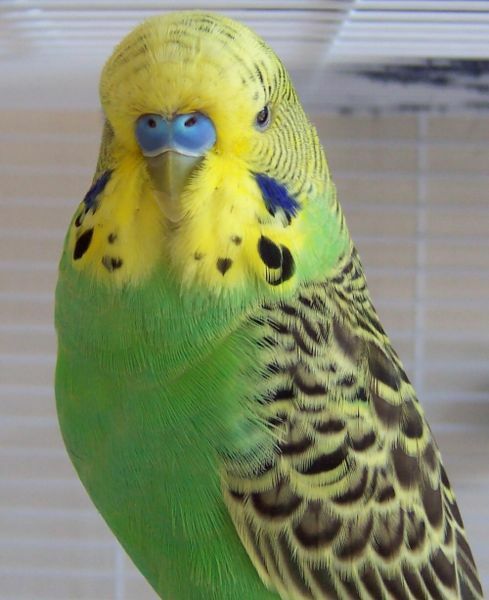 Blood tests for bird fanciers and farmers lung are available to any GP in the NHS, and have been greatly improved in recent years, but the diagnosis will never be made until irreversible damage to the lungs has occurred unless the doctor is aware that even one budgie is enough to cause this disease. An asthma nurse specialist in charge of a Chest Clinic was always warning her husband, who was a keen pigeon fancier with a loft full of pigeons, to be very careful about the danger posed by dust from the loft and bloom on the pigeon's feathers. Unfortunately, she did not realise that her insidiously increasing breathlessness was due to bird fanciers lung caused by a single budgerigar she had had for five years, in her kitchen, until she was quite seriously ill, and the diagnosis was made. Early diagnosis and removal of the bird will prevent these unfortunate patients from becoming steroid dependent chronic invalids. I will never forget being asked to see a patient at home and found her lying on a couch right underneath the budgie’s cage! I would have been stupid not to realise the diagnostic significance of this scenario. Coeliac disease, and lung diseases caused by inhaling organic dusts now have the great advantage that there are blood tests available which can lead to a definite diagnosis, but the possibility has to be suspected before these tests will be done. Today it is much less likely that a family doctor will be aware that a patient with chest problems is a pigeon fancier or keeps birds, because home visits are seldom carried out, there is little time for taking a full history, and patients do not always see the same doctor so that continuity of care may not be possible.